In this video we will discuss how to get authenticated user identity name in asp.net web api and display it on the web page. This is continuation to Part 26. Please watch Part 26 from ASP.NET Web API tutorial before proceeding. We want to display the logged in username on the web page as shown below. Step 1 : On the Login.html page, store the username in the browser local storage. The success() function is called when the user is successfully logged in. The response that we get from the server includes userName property which has the userName that is used to login. We are storing the logged in username in the broswer localstorage using the key userName. 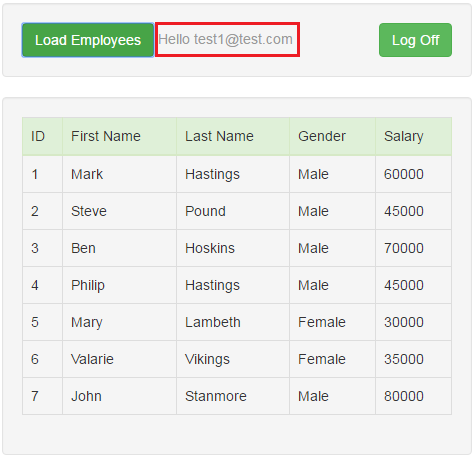 Step 2 : On the Data.html page include the following span element just below the "Load Employees" button. We will use this span element to display the logged in username. Step 3 : On the Data.html page, in $(document).ready() function include the following line of jQuery code to retrieve and display the logged in username. To see what the respective properties return, set a break point in the Get() method of Employees controller and run the application in debug mode. Navigate to Login page and login. On the Data.html page click "Load Employees" button. When the execution pauses at the breakpoint, open Immediate Window and type the above properties one by one and press enter. To open immediate window, in Visual Studio select Debug - Windows - Immediate. Now let us see what these properties return if we are not logged in. 1. 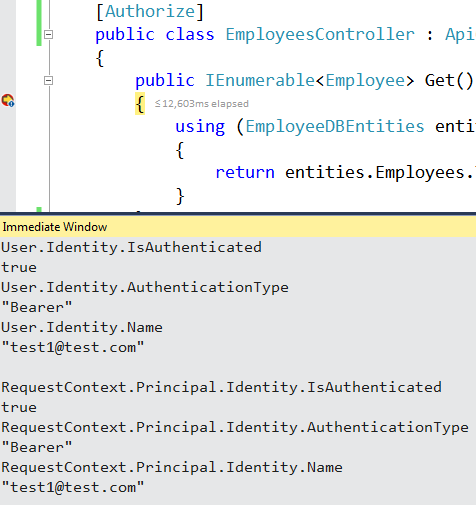 Add a new Empty Web API 2 Controller to the EmployeeService project. Name it TestController. 2. Copy and paste the following code in TestController. 3. 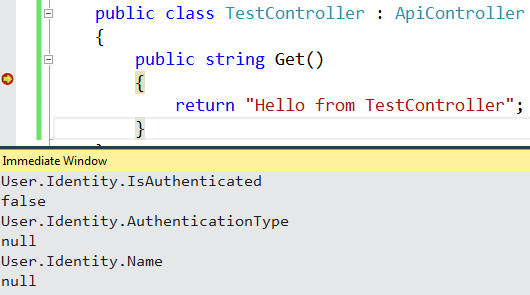 Set a breakpoint on the Get() method in TestController. Run the application in Debug mode and navigate to /api/Test. When the execution pauses at the break point, open Immediate Window and type the above properties one by one and press enter. Since we are not logged in, notice IsAuthenticated property returns false. Since we are not authenticated AuthenticationType and Name properties return NULL.